[h0,h1,g0,g1] = firpr2chfb(n,fp) designs four FIR filters for the analysis sections (h0 and h1) and synthesis section is (g0 and g1) of a two-channel perfect reconstruction filter bank. The design corresponds to the orthogonal filter banks also known as power-symmetric filter banks. n is the order of all four filters. It must be an odd integer. 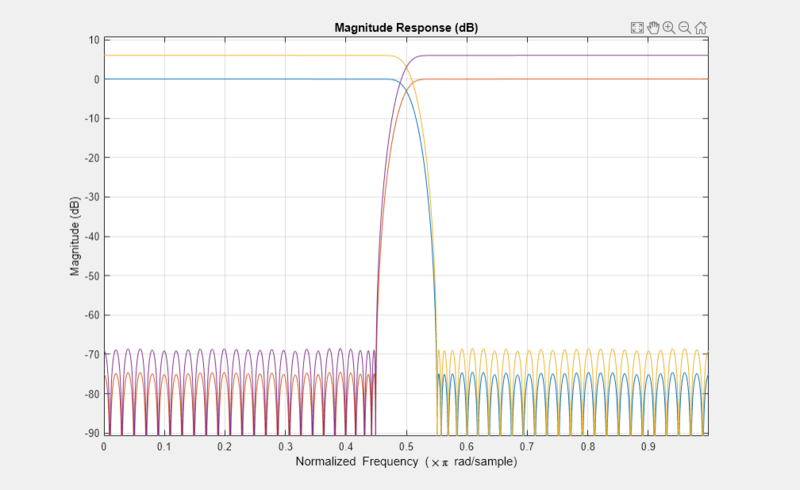 fp is the passband-edge for the lowpass filters h0 and g0. The passband-edge argument fp must be less than 0.5. h1 and g1 are highpass filters with the passband-edge given by (1-fp). [h0,h1,g0,g1] = firpr2chfb(n,dev,'dev') designs the four filters such that the maximum stopband ripple of h0 is given by the scalar dev. Specify dev in linear units, not decibels. The stopband-ripple of h1 is also be given by dev, while the maximum stopband-ripple for both g0 and g1 is (2*dev). [h0,h1,g0,g1] = firpr2chfb('minorder',fp,dev) designs the four filters such that h0 meets the passband-edge specification fp and the stopband-ripple dev using minimum order filters to meet the specification. 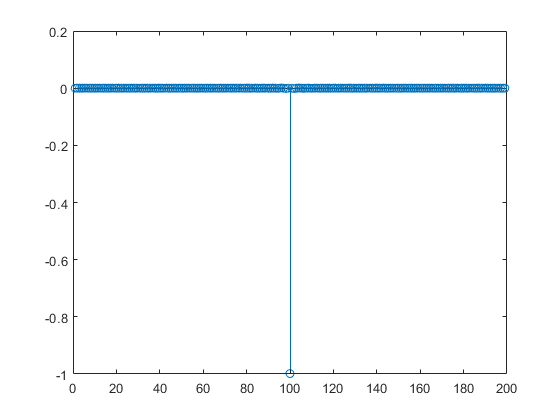 Design a filter bank with filters of order n equal to 99 and passband edges of 0.45 and 0.55. Here are the filters, showing clearly the passband edges. Use the following stem plots to verify perfect reconstruction using the filter bank created by firpr2chfb.